Get $5 off your first purchase when subscribe for email. Have a super summer and save $10 when you spend $99+ and enjoy free shipping across Canada! Enjoy the savings. $10 off and FREE SHIPPING on orders over $49! Get $10 off an order of at least $99 PLUS get a FREE gift, FREE sample, and FREE shipping in Canada! Get $10 off on orders of $99 or more + free shipping to anywhere in Canada. Free Shipping on All Orders $49+ in Canada. Get 12% Off Bell Supreme Immune Booster 500mg, 90 Capsules. NEW WORKING!!! Get $10 off and FREE SHIPPING to anywhere in Canada on orders of $99 or more! Enjoy the deal! Get 10% off all Animal parade Vitamins.Applies to single unit pricing only and excludes bundles. Enjoy $10 off your first order of $99+ and get free shipping anywhere in Canada. Stock up on Vitamart essentials for summertime! Get 20% Off AOR Products. Limit one coupon per order. Get 40% Off Mutant Mass, 5 lb. Save $10 on your first order, and FREE SHIPPING on orders over $49. Amazing deal! Get 9% Off CanPrev pH-Pro, 90 Vegicaps. 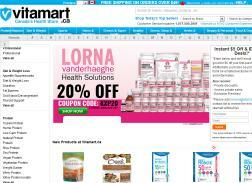 Get 25% Off Lorna Vanderhaeghe Thyrosmart. Get 20% Off Dymatize Iso-100 Hydrolyzed Whey Isolate. Get 10% off when you spend $99 or more on Sale Brands. Buy two Shaker Bottle vitaNEON Series, 800ml Get one free. Must add 3rd to cart. Get $10 off any order over $99 and free shipping anywhere in Canada. Great coupon! Get 15% off when you spend $199 or more on Sale Brands. Get $10 off on orders of $99 or more + free shipping to anywhere in Canada. Happy holidays! Get 20% off when you spend $299 or more on Sale Brands + Free Samples. New Customers SAVE $10 on first order of $99 or more!! Plus enjoy free shipping in Canada!